"Man's best friend" is a cliché for a reason -- for many of us, our canine companions are more than just pets; they're very important members of our family. More people are waiting longer to have children (if we choose to have them at all), so we generally have more time, energy and resources to dote on our pets than ever before. The pet care industry reflects this trend: According to the American Pet Products Association, Americans spend more than $3 billion a year just on services for their pets. We don't just want our dogs to be healthy -- we want them to be happy and to know that we treasure them. What better way to show your affection than to give your pooch some serious pampering? 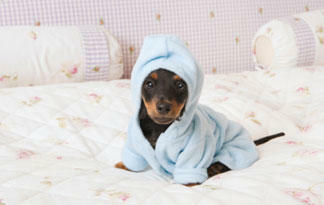 You may think that you can't afford to pamper your dog. While it's true that pampering implies luxury, there are plenty of simple, inexpensive ways to do it. Of course, some dogs get the kind of special treatment that can make humans jealous, and if you have the budget for it, the sky's the limit. Many owners equate pampering with feeding their dog human food or giving him lots of treats, but too much could have the unintentional effect of making him ill at the very least or overweight at the worst. It's also important to remember that there's a fine line between pampering and spoiling -- indulging bad behavior in your dog doesn't serve either of you very well. So if you don't usually let your dog sleep on your bed, for example, offering to let him to do so sometimes will only send him mixed messages. The best ways to pamper your dog involve spending quality time with him, keeping him active and feeding him well. Next, find out how you can make your dog feel special using things you probably already have around the house. Most dogs love to eat, well, just about anything. A treat for your dog can be as simple as a few small bits of unseasoned, cooked meat or cooked vegetables like green beans or carrots. You can even bake your own dog treats; just make sure that your recipe doesn't include any ingredients that aren't good for dogs, like onions. 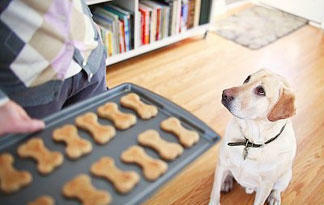 If baking isn't your style, look for high-quality treats online or at speciality pet stores. Most of your dog's nutrition should come from meals, not snacks, so keep that in mind when doling out the treats. It's also a good idea to ask your vet about your dog's snacks. One easy way to pamper your pet is to plan activities with him in mind. If your pet loves nothing more than exploring the great outdoors, consider taking him hiking. Dogs who love playing in the water, like Labrador Retrievers, would probably enjoy a trip to the lake. Many communities now have dog parks, where your dog can go off his leash and socialize with other dogs. There are even private dog parks such as WagsPark in Cincinnati, Ohio, where for a small fee (or a membership), your dog can hang out in a fountain, dive off a diving board into a lake or frolic in a special play structure. If your dog did well learning basic commands, he might be great at agility training. Athletic, working breeds like Boxers or Border Collies might enjoy the challenge, and you'll bond with your dog as you learn how best to direct him through a course. There are numerous official agility organizations, including the United States Dog Agility Association and the North American Dog Agility Council, which can help you locate training and competition opportunities. Maybe your pooch isn't the competitive type, but if he's very calm and loves people, he might enjoy being a therapy dog. Dogs can give comfort, happiness and affection to those in nursing homes, hospitals, shelters and schools. Ask at your local nursing home or hospital to find out if they have a program in place. Organizations like Therapy Dogs International can evaluate your dog to see if he's suitable, as well as register you as a team and connect you with programs and facilities. Ready to take it to the next level? Read on to learn about ways to pamper your dog that might make some humans in your life jealous. Maybe that plain doggy bed isn't cutting it for your canine companion. If not, you can give your dog a seriously comfy sleeping spot such as a Tempur-pedic dog bed, made of the same viscoelastic memory foam they use in mattresses. Dogs that are short-haired or have joint problems may especially enjoy heated dog beds. Some have microwaveable inserts, while others plug into the wall. For dogs that have to spend a lot of time outdoors, you can buy an insulated doghouse; some even come with heaters or have cooling beds built in. When your dog does have to leave the confines of home, a down coat or wool jacket can make winters more bearable, while booties on his feet can keep ice and snow from hurting his paws in the winter and hot asphalt from burning them in the summer. You don't have to sacrifice style, either; plenty of companies, from Juicy Couture to Burberry, make designer doggy duds. What if you want to take your doggie out on the town? Many restaurants with outdoor seating welcome dogs, and some even have special, dog-friendly events. Hotel Indigo in Atlanta, for example, hosts a Canine Cocktail Hour on Tuesdays in the summer. The Lowes chain of hotels and resorts provides pet guests with room service, beds, snacks and pet-walking services. 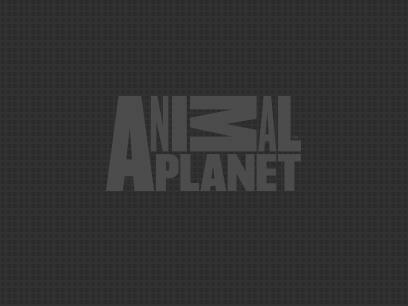 Check out PetFriendlyTravel.com to learn about more restaurants and hotels that are happy to have dogs as guests. Sometimes, you just can't take your dog with you. If the idea of having him spend most of his time in a small kennel is just too upsetting, maybe a luxury pet resort will ease your mind? At these resorts, your dog can have his own room with a comfy bed, go for a swim, take long walks, watch TV and even get massages. He may not want to come home! Speaking of massage, there are certified canine massage therapists who study how massage techniques can be applied to dog anatomy and physiology. 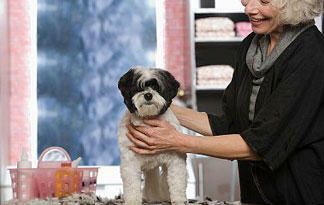 In addition to pet resorts, there may also be one on staff at your local groomer's or veterinarian's office. If you'd rather be more hands-on, you can take a workshop in dog massage as well. Consider working it into a weekly brushing routine and trying out special shampoos and conditioners when grooming your dog (for those times when you can't get him to the salon, of course). Pampering your dog is a wonderful way to show him how much you care, but ultimately, the best way to do that is to spend some quality time with him. He loves you unconditionally and that's all he asks for in return. What's a dog's normal body temperature? Benefits of high-fiber dog food?